Employees are like a backbone of any organization. A famous quote by Richard Branson goes as “Clients do not come first. Employees comes first. If you take care of your employees, they will take care of the clients”. We understand very well that managing and running an organization is a big task as well as responsibility. Employers have to look in each and everything that is connected to their organization , be it the maintanence, productivity, proper work process, task assignation, deadlines, safety and security etc. Oops!! we missed one important thing and that is “Employee management”. We do not ask the employers to treat the employees as Kings but at least not as machines or slaves. Employees and workers work very hard for the company benefit and success. Overburdening of work on them makes them dissatisfied and stressed out, which would ultimately lead to poor performance and a decrease in productivity of the company. 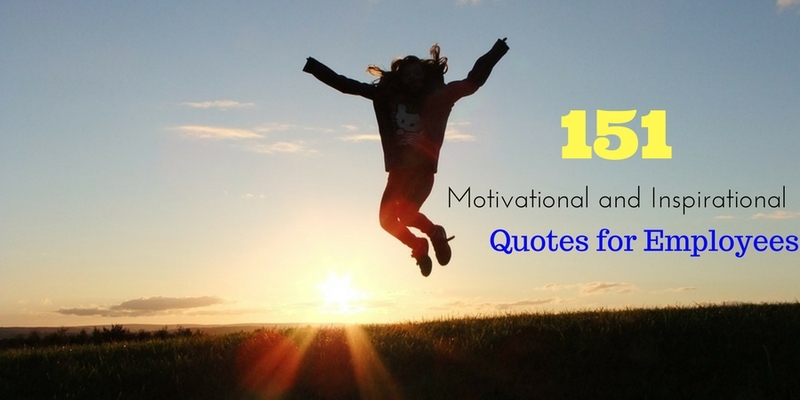 The following mentioned are few motivational quotes for employees that would boost their morale.